Ben is our child who lives to serve. I think his first full sentence was, "I want to help you". We have to manufacture ways for him to help us, which ends up not helping us at all! I had a medium-sized grocery list and an hour between Kinder pick up and second grade pick up, so Ben and I hit the grocery store. On the drive there, he begged to push the cart. Mindful that I only had ONE hour to get all the marketing done, I said maybe. 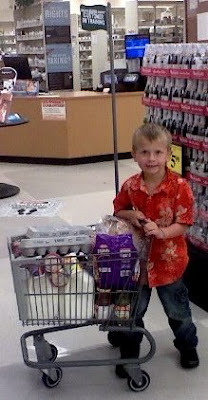 So imagine our delight when we found these "grocery shopper in training" mini carts at the store! Ben was so careful not to run into anyone and he would not allow me to put anything in the cart - he had to do it, and put it in just the right place. He takes after his Daddy in the "spacial" department... I would never have fit all those groceries into that tiny cart, but my five year old did! He got lots of compliments from everyone in the store on what a big helper he is. He was so proud that I had to snap a photo with my phone. Now I'm going to have to keep going to that particular market or figure a way for him to grow about two feet to see over the top of a normal cart. And so the fun begins! Did they bug our car? Nate the Great is Eight!